I’ll go out on a limb here and say that you probably did not expect to see this. That's Connor when he was about seven. If you look carefully on the couch there, you’ll see our Metro’s sweet face. God, I miss our little pup. Well, good to see you. Hope you had a grrrrreat weekend! Oh. The tree. Did I mention that I used to grow banana trees in my living room? Oh, c’mon…like you’ve never done it. Here in Kathrynville, we’re big on giving it the ‘ole college try. And to answer your next question (I know you guys so well….ain’t it great?) yes, we gave it a name. “DC”, short for Dwarf Cavendish, had the capacity to grow to 10-12’ and then fruit, under the proper circumstances….which was supposed to be…I dunno….maybe Florida? I had a lot of windows! I could sit and read a book underneath a banana tree in my living room! I had cathedral ceilings, so they could grow even taller if they wanted to! 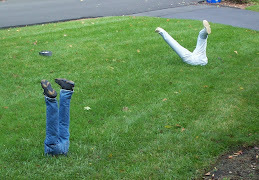 No-one told me they couldn’t be grown indoors…in New Yawk! Do you know what the problem is with growing banana trees indoors? They need lots of humidity….something you don’t see often indoors in the winter. Otherwise, you get spider-mites and they’ll kill your tree. You have to keep re-potting them into something larger or they’ll get root-bound and die. Watering ‘em is an exact science. Too little, they’ll die. Too much? Ditto. Alas, DC died before she gave us any naners. But we loved that tree, dammit. 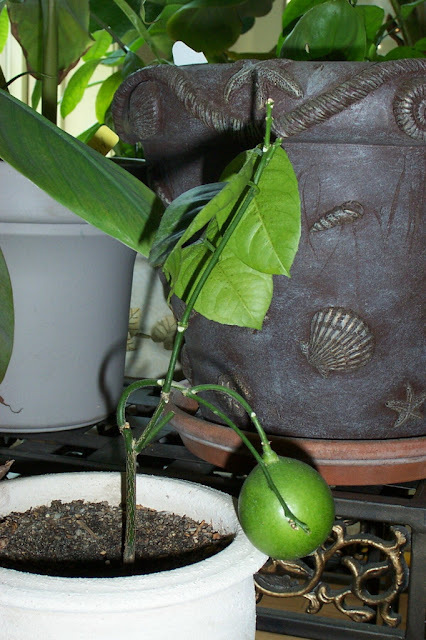 A few years ago, I tried to grow a lemon tree as well. This little bitty tree and I went through two years of me attempting to nurture it and it doing its best to die peacefully just stay alive. See how I artfully propped it up with pieces of bark from outside so it could finish ripening? I’ll bet you’d never have noticed that if I hadn’t pointed it out. It fully ripened and we had a big ceremony, followed by a huge debate as to what final purpose our singular home-grown-two-years-in-the-making lemon should have. I remember Taylor voted to squeeze it on shrimp cocktail…Connor wanted to squeeze it into some Pepsi. I recall my protests of ,“Stop talking about squeezing it, for God's sake! Is that all you guys think about?”…for I’d become quite protective of my little charge. In the end, we cut it three ways and everyone did their own thing, with me opting to save each and every seed (for future generations of healthy stock, which I eventually threw away 'cause they got moldy). I recall making the world’s smallest glass of lemonade with my third. So, it got squeezed anyway. The plant died the next week and I just didn’t have the heart to give it another go. Or, so I thought. See this? I've loved every one my fruit trees. They remind me that anything is possible…especially if you don’t realize that you’re attempting the virtually impossible. Virtually, maybe. Completely impossible?? I beg to differ. that is awesome! 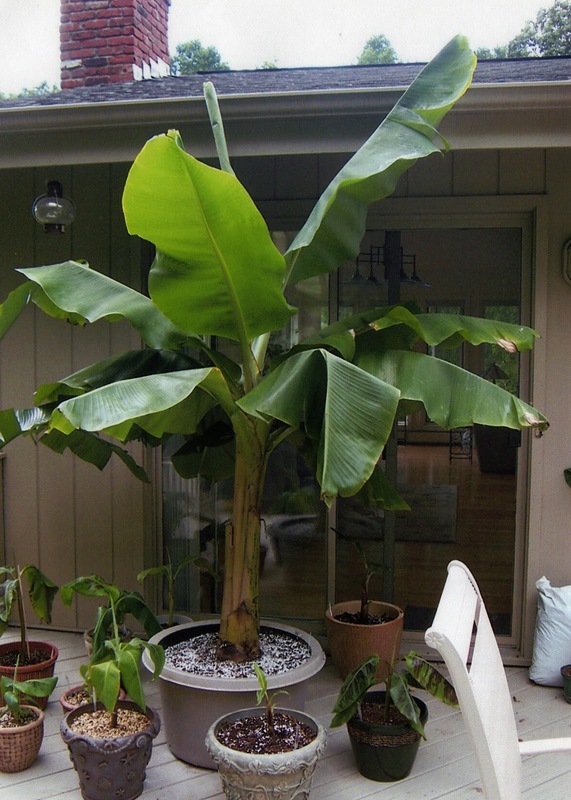 I would love to have a banana tree in my living room! what is the opposite of green? what ever it is thats the color my thumb is. I even had a cactus die on me once, seriously. That right there is another reason why you're awesome, and why Kathrynville is an amazing place to live. That much patience? AND you didn't simply opt to squeeze LL (that's Little Lemon, in case ya didn't figure; I just thought he at least deserved a name, having spent 2 years struggling to, errr, just stay alive). This is why I think you belong in California, we have tons of different fruit trees here. Well I actually don't have any, but my dad has a fig tree, a white peach tree, an orange tree, a lemon tree, some corn, cactus, jalapeno peppers...the list goes on and on. But I must say, you do have a green thumb! So when will that key lime produce a pie? Let me know - cause I will sooooo be there! I'll bring the margaritas. I will NEVER look at pictures of rooms with plants in the background the same way again. That is wild. Glad you have such a green thumb--I think we max our indoor talents with peace lilies. I love that you grow banana trees in your living room. What an optimist! We have lots of fruit trees here on the farm, but they are all outdoors. Winter figs are just ripening and I'm getting walnuts not, too. I love free food. That's one heck of a lemon on that little bitty tree! Way to go! Key limes from seed? Seriously lady, you need to move South where that Green Thumb of yours would flourish like the Amazon! I grew up with Banana plants. They never produced any nanners before the inevitable surprise frost would strike them down. BUT, our friend from Honduras used to take a couple leaves a month and make up some tamales (wrapped them in strips of the Banana Leaves). I wish I could grow plants... I just seem to kill them... I don't really know why. Don't look at me like that. I have nothing against plants... Okay, I don't like the bugs, but other than that, I have nothing against plants! The death of that lemon is not your fault. It was on the way out well before you got the thing. They just take ages. And you were brave having a plant that size with wood floors. I think that is awesome that you tried. You actually produce a lemon! Something I have never tried for sure! 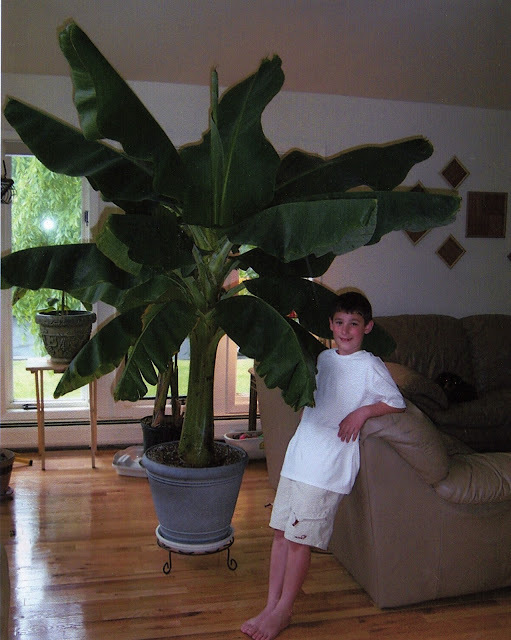 I love that pic of the massive banana tree in the house! LOL! Good luck with the lime tree! I smell a Margarita! Christopher: Aw. C'mon...it's probably not that bad. Water, some food (I think cactus' like chicken...ya know, like KFC?) and LOTS 'O LIGHT. I've never had a house, before or since, that aided in growing plants like that one. 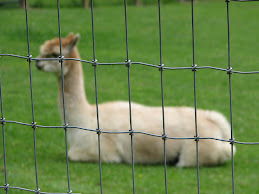 Even that last photo (which I took last night) shows something that's a tad....spindly. It's the lack of sunlight, I'm sure. Fierce: Hey, pretty girl! Yeah, it's certainly never boring over here, eh? (You Canadians like saying "eh", eh??) I'd considered trying to grow coffee beans...but I've heard they take 7 years to produce fruit. Um. Pass! Gigi: Honey, thank you for staying awake just for little 'ole me. I hope it was worth the lack of sleep! As far as that pie goes, if it produces any fruit, we'll probably be able to make the world's smallest key lime pie...we'll both get about 1 fork-full...but you are SO ON! Oddyoddyo13: I know! Think I went too far? I couldn't find the photo I took at Christmas that year...if I do, I'll def. post it. It looks like my family's wandering around in the jungle! It was AWESOME. Holidays amidst the trees...(but with no bugs, and really good hair). See? Perfect world for ME! injaynesworld: Thank you, sweetie. I've gotta tell you: I cannot think of a better mental picture than the one you've described. 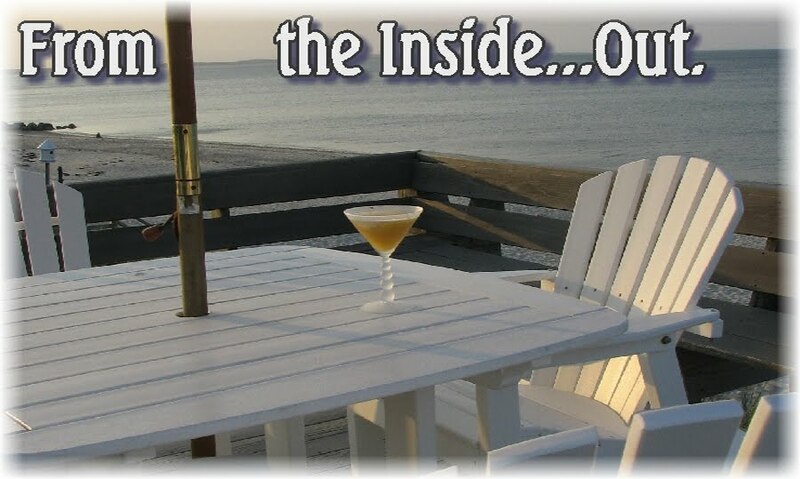 That was the day I got inventive and made peach martinis...fitting when we talk about fruit trees, huh? Only, I'd respectfully suggest we bring out the pitcher with us. You know...so we don't have to get up. Dorn: I KNOW! Cute little sucker, right?? Ooooh...you're making my heart go all pitter-patter. It warms my heart to think that da boys can say they grew up with naner trees as well (though yours were the real deal, fruit or not!). The leaves on DC were HUGE...almost 4'! I can only imagine how big the 30-40' versions are like! Lauren: Well, yeah. I mean, naturally we hate the bugs, dear. That's a given. That's the incentive to create a nature-world indoors....and it's a strong incentive. Just enough humidity to keep 'em healthy but not to ruin the hair. It's a tough balance. Oh, and for the record? I'll only try to grow something TROPICAL. Vince: Ha! Eagle eye, my man...I used to have to put down a plastic tarp every time I watered that jungle. Especially 'cause I needed to spritz 'em with water to keep the moisture up and those damn spider mites at bay. And yes, the lemon followed the circle of life....at least I did it! I thought you were just leaving us hanging there with a picture of Connor and some big-assed plant and I was going to say something like, "Nice plant!" and then, there it was, a whole, very funny tale about the plant. Put a smile on my face this yucky Monday morning! I love this post!I can't keep plants alive- I must not have the nurturing gene that gardeners have. good luck with your key lime! to make you jealous, I am going to the beach tomorrow, Ft Walton Beach, FL and it is still warm at the gulf of Mexico; listed on every desert menu is Key Lime pie! LMAO!!! I love the picture of the giant banana tree with all of it's little spawns surrounding it. Simply hilarious. Also, the lonely lemon cracks me up. Seriously, what on Earth? The plant was certainly the "little plant that could". Love the little lemon tree also! I tried to grow a pineapple plant. Unfortunatly it never took root and just stunk up the place so I got rid of it. You may inspire me to try again, though! I, too, love things tropical and reading a book under a banana tree in your own house sounds wonderful! That is incredible! I can barely keep my orchids looking alive. I've given up on herbs. Although at least basil lets you know when it needs watering and responds well. I wouldn't even know where to start with tropical fruit! I know you never paid cash for the fruit itself. But, given the process and effort, that's probably the most expensive lemon I've ever seen. I would have squirted my portion in my bother's eye just to make sure I got my money's worth. You nut. All that wasted space when you could have been singing my praises, or helping me obtain a green thumb, or...the possibilities will make you go bananas. Cathy Webster (Olliffe): Aw! Then my evil plan worked! Congrats on the wedding, girlfriend! I hope you're settling into the joys of wedded bliss. I'll be by to say hello in a bit! Daily Panic: Oh, yeah...I am green with envy. My mouth is watering for some key lime pie...and a cocktail under a nice palm tree...feeling the sand between my toes....oh, yeah. You are one lucky gal. Have a slice for ME! Kimberly: Aw. What a sad....yet typical story of a Dad, a young boy, some stairs and a collision with a banana tree. I'm sure it's a story told around the world. No, wait...I think you've cornered the market on this one, sweetie! Monica: I know, right? I also tried a pineapple...with the same results that you had. I can only assume we didn't plant it correctly. Don't you just lop off the top and stick it in the dirt? (That's all I did.) We shall have to check with our good, all-knowing friend, Google. Runnergirl: Well, I didn't think orchids were so easy to nurture either, sweets! I've never tried them. I just love anything that fruits and makes me feel like I'm on some tropical island. I'm afraid basil just wouldn't cut it for me! Straight Guy: Oh, this is soooo true. 2 years of my life...plus the plant food and all that nurturing. I'm envious of anyone who just walks out their back yard and picks a piece of fruit off their tree. I just read to Connor your comment and his response was, "Oh, sure. NOW he thinks of the perfect use for my third!" HA! Mike Vaz: Yeah...gardens are a whole different ballgame. Bugs and varmints and diseases, oh my! Hard to control your environment when it's the whole outside, right? Nance: Oh, you are a card. You managed to replicate my insanity...and all in a single comment. You are equally insane...but definitely in a great way! My first thought in that pic was "METTY!!!" Sigh. Sweet boy. I like this post. Fruit trees make me happy. We had these lemon/lime trees next to my house growing up and every single year they would produce just an obscene amount of lemon/limes. And every single year, we began the discussion of "Are they lemons? Or are they limes?" They were big and green and fat, but then if you left them just long enough, they would start to turn yellow. So were they lemons that were ripening, or were they limes that were overripening/rotting? One will never know I supposed. I'm just catching up today, Kathryn, I'm SO behind! But I lovelovelove this picture... reminds me of how we met. I have two banana plants right now, but neither of them look anywhere as nice as yours did. 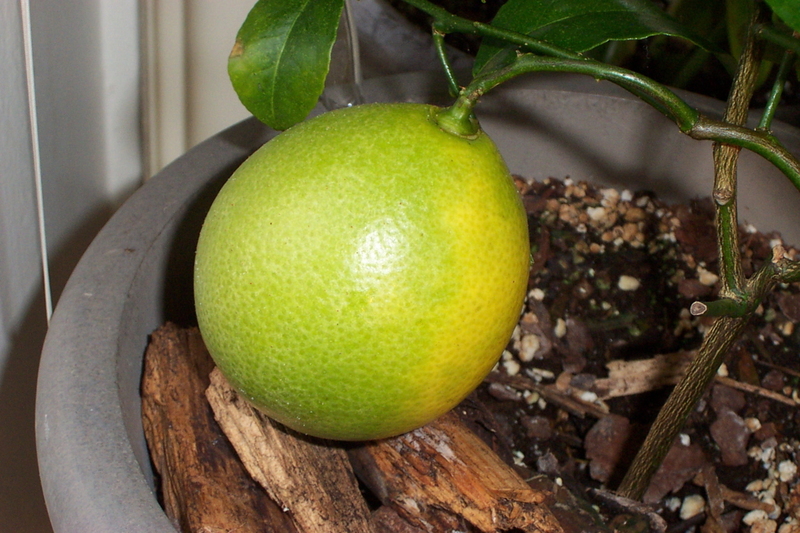 I do grow some citrus plants too, lemons, grapefruit, limes.. but it really is hard to grow them in the north. You have to have the right soil (very important), light and warmth balance, among other things (nutrients, etc). I started 7 key lime plants myself from seed, they're very tiny right now. I am curious to see if they survive!